At the bottom of the street where we stayed was a fantastic looking bakery that caught my eye every time we passed. A large wood fired oven was surrounded by a horseshoe of marble slaps. Each morning the bakers were dusting their marble benches liberally with semonlina and then kneading and shaping the dough. Batches of lavas would be placed in the oven and once cooked they were piled up ready to be collected. On my final day in Beyoglu I couldn't resist any longer and visited the Yoremiz bakery for a late lunch. I don't think they get many camera wielding Englishmen in the bakery. I was an oddity to say the least. With the lunch rush over I was the only customer in the shop and it wasn't until the cheeky apprentice beckoned me to take his photo that the ice was finally broken. Slowly the other bakers warmed to me and realised that I was interested in bread making, demonstrating to me how they shaped the lavash before they placed them in the oven. With a random point at the printed menu on the wall I ordered a Kasarli Kiymali, a meat with cheese pide. A thin smear of lamb and beef mince spiced with red pepper paste was placed on the dough, topped with white cheese, the edges folded over and then it was placed in the oven. 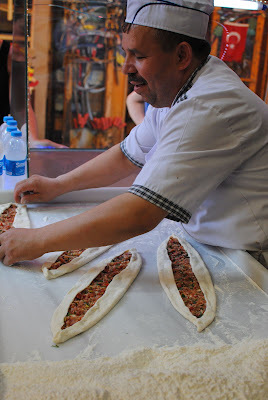 I was surprised how long the pide was baked for. It clearly operates at a lot cooler temperature than the wood fired pizza ovens I was expecting it to be similar to. When the pide came out of the oven it was left to cool for a few minutes and then cut, stacked, wrapped and given to me to take away. The second pide shop I visited was part of the Istanbul Eats Walking Tour that I took while on holiday. Mavi Halic Pidecisi is located on a busy pedestrianised street close to the spice market. This baker certainly wasn't shy about having his photo taken and was quite happy to show off his skills to the camera. It wasn't quite a intriguing to see someone work and shape the dough a second time round. But this time I managed to get involved! The baker beckoned for Kish to touch some of the dough. 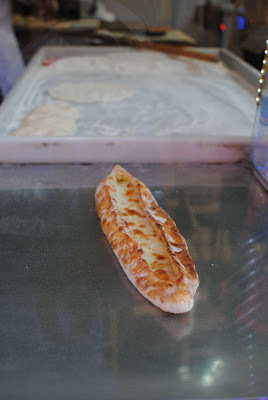 Momentarily unsure if I should hold back, I overcame my hesitation and dived in to see if I could shape a pide. I tried my best to copy our host as he worked at light speed. It was a smooth and elastic dough, but my pizza shaping skills have never been that good. I got the pide to around two thirds of the size it should be and stopped for fear of tearing the dough. My companions on the tour were laughing at my rather feeble effort so I got stuck in again, and although putting a small tear in the dough, I got it to the right size. The baker left my dough sitting on the marble slap for an uncomfortably long time and I thought he was going to throw it out as soon as we'd left! However, he turned it into a cheese pide ready to sell to a lucky customer. I'm sure it would have been the best thing the luck punter ate all day. View Istanbul July 2012 in a larger map Key: Yellow sights. Green visited on the Istanbul Eats food tour. Red eaten at and reviewed (outside of the food tour). Blue places stayed.